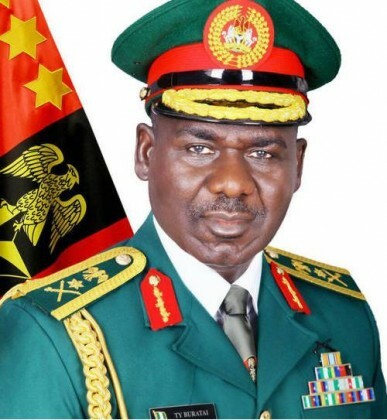 Lt.-Gen. Tukur Buratai, Nigeria’s Chief of Army Staff (COAS), on Friday said his vision was to have a professional and responsive army in the discharge of constitutional roles. Buratai, represented by Maj.-Gen. Eniobong Udoh, General Officer Commanding (GOC) 6 Division of the Nigerian Army, Port Harcourt, made the remark at the ongoing 13th Editors’ Conference holding in Port Harcourt. He said that the vision was intended to ensure seamless connection between the ends, the ways and the means of tackling insecurity as the army continues in safeguarding the nation’s territorial integrity. “In order to maintain such pride, I have laid structures for effective leadership and personnel management because the army must strive to remain as an institution of authority. “It is to create responsibilities, provide direction, inspiration, vision and communicate same to personnel at all times,” he said. According to Burutai, the army by going this direction will be poised to confront evolving internal and external threats in order to guarantee the sovereignty of the country. “In so doing, we are avowed to remain firmly apolitical in order to always find ourselves in a good stead to defend our constitution by providing the needed security environment for the survival of democracy,’’ said the COAS. Burutai stated that the core values that emanated from professionalism and responsiveness included training, regimentation, welfare, operational exigencies logistics, inter-agency cooperation and observance of human rights. “Typical examples of the pillars of professionalism and responsiveness are the exercises that the army has been conducting in the established crisis areas in the country,” he said. The COAS recalled that he was appointed when the Boko Haram insurgents had instilled fear in the psyche of Nigerians and most of the troops’ locations were lost to the control of the terrorists. He said it was unfortunate that several officers lost their lives in that process leading to a general dampening of the troops’ morale and fighting spirit across the country. “On my appointment, therefore, I was naturally confronted with the urgent need to institute workable measures aimed at reversing this ugly trend. “This is with a view of repositioning the theatre to begin a positive drive towards winning victory against the Boko Haram terrorists,” Buratai said.